If you see wagging tails and hear barks in your office Friday, you are not imagining things. Offices around the world will be full of four-legged furry co-workers to celebrate "Take Your Dog to Work Day." 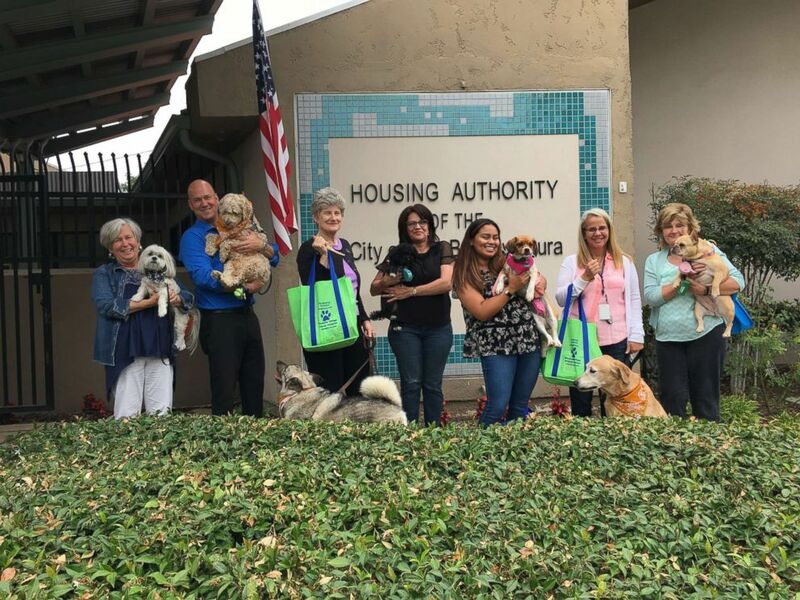 The annual event was started by Pet Sitters International (PSI), an educational association for professional pet sitters, 20 years ago as a way to promote dog adoptions. Coworkers show their dogs during Take Your Dog to Work Day. The day, which is always celebrated the Friday after Father's Day, is intended to show the great companions dogs make. Some companies partner with local rescue groups and animal shelters to bring adoptable dogs into the office, according to PSI. Some companies, like Amazon, allow dogs in the office 365 days a year. An Amazon employee gives her dog a biscuit as the pair head into a company building, where dogs are welcome, in Seattle, Oct. 11, 2017. 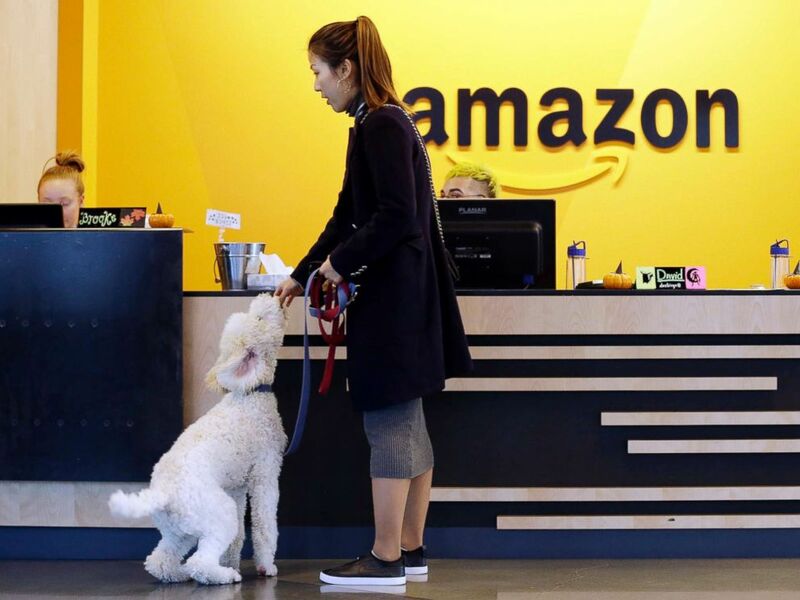 As many as 6,000 dogs "work" alongside their owners at Amazon offices. Reception desks at the company's Seattle headquarters are stocked with dog treats, dog-friendly water fountains abound and one building even has a "doggie deck" with a fake fire hydrant. 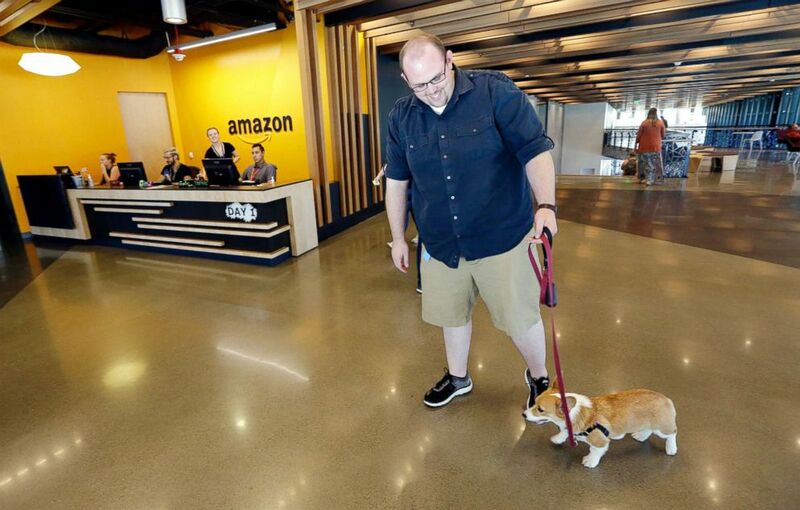 An employee arrives with his dog inside Amazon's Day One building in downtown Seattle, Sept. 27, 2017. Another company, Tito's Handmade Vodka, not only allows dogs to roam its Austin headquarters, it also started an animal rescue program, Vodka for Dog People. Some of the most talked-about benefits of pets in the workplace include a better work-life balance, better communication among employees, improved morale, better recruiting for employers and fewer absences among employees. In at least one study, employees who brought their dogs to work were found to also have reduced stress throughout the day compared to their colleagues without pets. Companies around the globe are taking part in 2018 Take Your Dog to Work Day. Dogs may also have an advantage over another popular pet -- cats -- when it comes to relating to office employees. A typical dog has nearly double the number of neurons a cat does in its cerebral cortex, the part of the brain that makes decisions and solves problems, according to new research published in Scientific American. 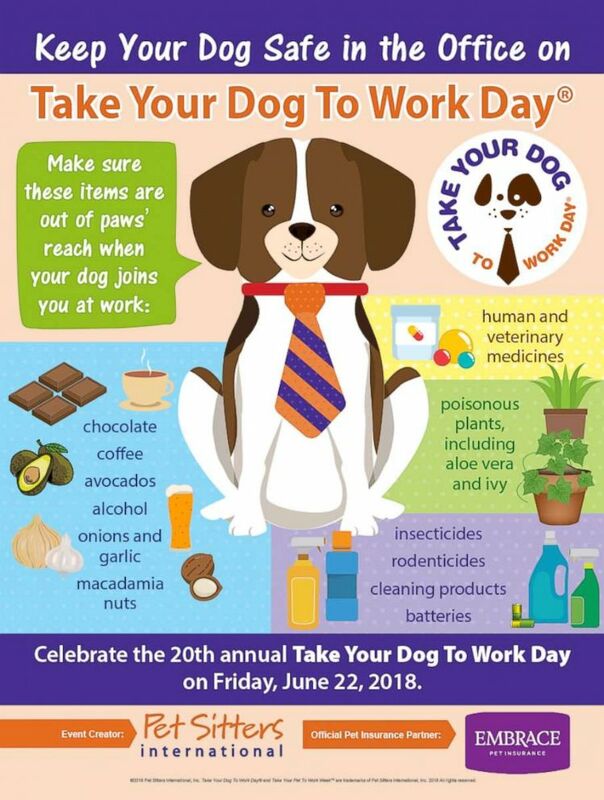 Ideas for celebrating "Take Your Dog to Work Day" range from hosting a photo booth for employees and dogs to scheduling an office picnic so the dogs can run around or just setting out some water bowls and treats for your four-legged friends. Here are seven tips shared by Pet Sitters International to make sure your dog doesn't bark up the wrong tree at the office. 2. Puppy-proof your work space. If you plan on working with your dog, make sure your office environment is safe. Remove poisonous plants, hide electrical cords and wires and secure toxic items such as correction fluid and permanent markers. Any office items in question should be placed out of paw’s reach. Download this handy infographic to help you pet-proof your office or workspace. 3.Make sure Fido is fit for work. Even dogs don't get a second chance to make a first impression. Be sure your dog’s shots are current. Make plans to have your dog bathed and groomed before accompanying you to work. Be mindful of your dog’s "work-readiness." You know your dog's demeanor, so if he or she is aggressive or overly shy, it's best to leave them at home. Consider how your dog has behaved in the past around strangers before making the decision to bring them. If your dog has shown fear, irritability or aggression, or if your dog has never met strangers, the workplace is not the best place for him or her. If bringing them to the office is a goal, work with a trainer in a class or private setting first until your dog is ready. Instead, consider bringing a favorite picture of your pooch. Pet Sitters International shares safety tips for Take Your Dog to Work Day. 4. Prepare a doggie bag. Include food, treats, bowls, toys, a leash, paper towels, clean-up bags and pet-safe disinfectant. If you are routinely in and out of your workspace, consider bringing a baby gate for your doorway or a portable kennel for your dog’s comfort and your peace of mind. 5. Plan your pet's feeding times carefully. During an important sales call is probably not the best time for a puppy potty break. Plan your dog's feeding time around your work schedule and be sure to choose an appropriate area for your dog to relieve himself afterward. 6. Avoid forcing co-workers to interact with your dog. Dog lovers will make themselves known. 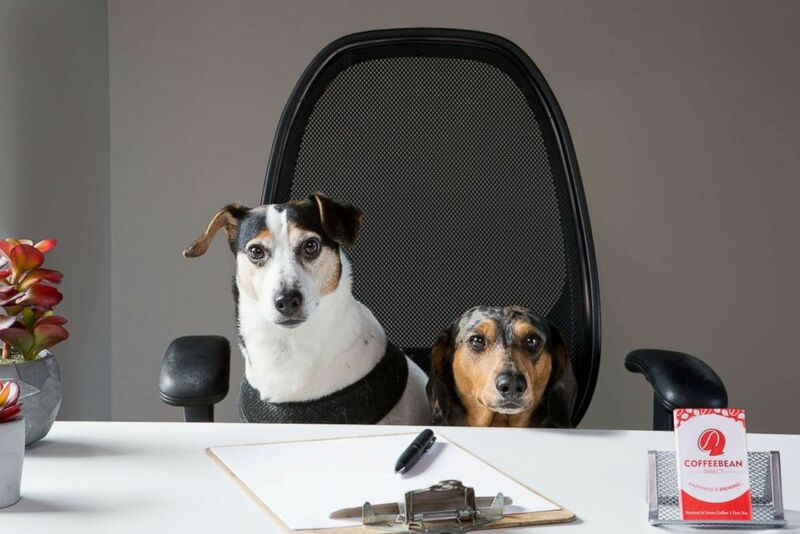 Sally from accounting and Joe in human resources may not want to play fetch or offer belly rubs, so be mindful of fellow employees’ time and space. To avoid pet accidents, monitor the number of treats your co-workers give your pet. Remember that chocolate, candy and other people food should not be shared with dogs and that not all non-dog owners will be aware that these items can be very toxic to your pooch. 7. Have an exit strategy. Although most dogs enjoy TYDTWDay, your pet may not. Should your dog become overly boisterous, agitated or withdrawn, consider taking him or her home or plan in advance for your professional pet sitter to offer a midday check-in visit. Never, under any circumstance, leave your pet alone in a vehicle while you work.